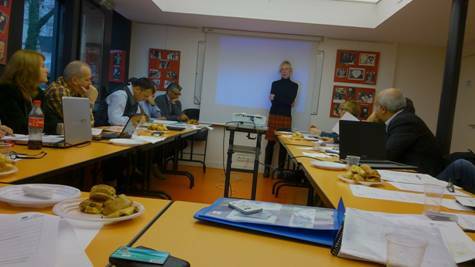 The whole consortium gathered in Paris the 28th of November at the Maison des associations of the 11th district of Paris. Will Evans (Amery Brothers) introduced the meeting and the project. Then, as we are many participants, each attendee introduced himself and his/her organization. Before the meeting, it has been asked to each organization to provide some research about co-working in their countries. The day started then by a presentation from each partner of its researches. Good practices will be summarized in another document. Then, we asked Basil Samson from studio Singuliers (co-working space in Paris: http://www.studios-singuliers.fr/) to come and join us to present the activity of his organization: One year ago, 5 co-working spaces in Paris but all specialized. Studio Singuliers has chosen to be generalist and without specialization. The space can welcome from 30 till 40 workers. Normally no more than 60 desks in Paris due to the rents. 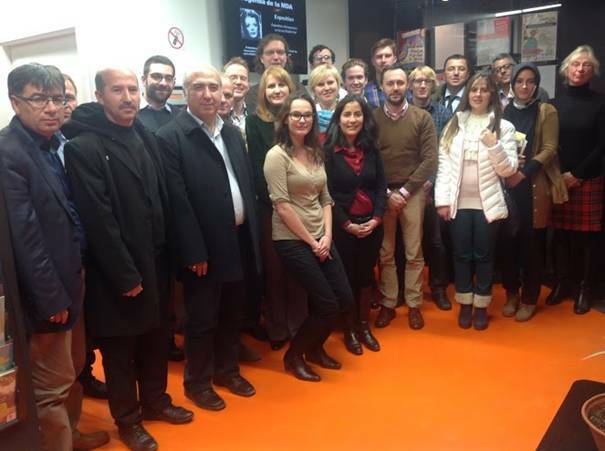 Discussion with Basil Samson and all partners about exchanging good practices. Informal discussions during lunch time. - Vision for the Outcome : we asked each participant to tell to the whole consortium about his/her vision of the outcome of the project. Lots of ideas have been raised. We decided to create an e-book and a website (blog). - Mobilities and topics : the list of future mobilities is available on “Paris decision” document. - Tasks (list of responsibilities) : also available in “Paris decision” document. The day 1 finished with a diner. We met at e-Junior work place for half a day of a meeting. 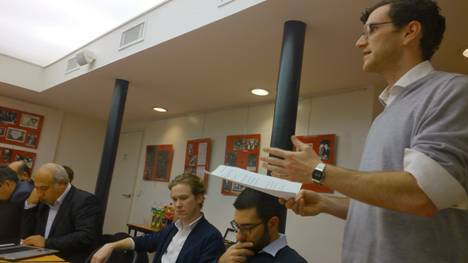 Will Evans (Amery Brothers) proposed us to work in small groups of 4/5 people (from different countries to create a representative sample of co-working communities across Europe) in order to think about co-working in support of a start-up community. To achieve that goal, he asked us 3 questions. Each group had to try to answer it and create a discussion about these issues. Then all responses were gathered and we all have a discussion about this topic. · Is there an existing demand for coworking space? Understand the kind of the demand. 2: What examples of best practice have we learnt about regarding Co-working?